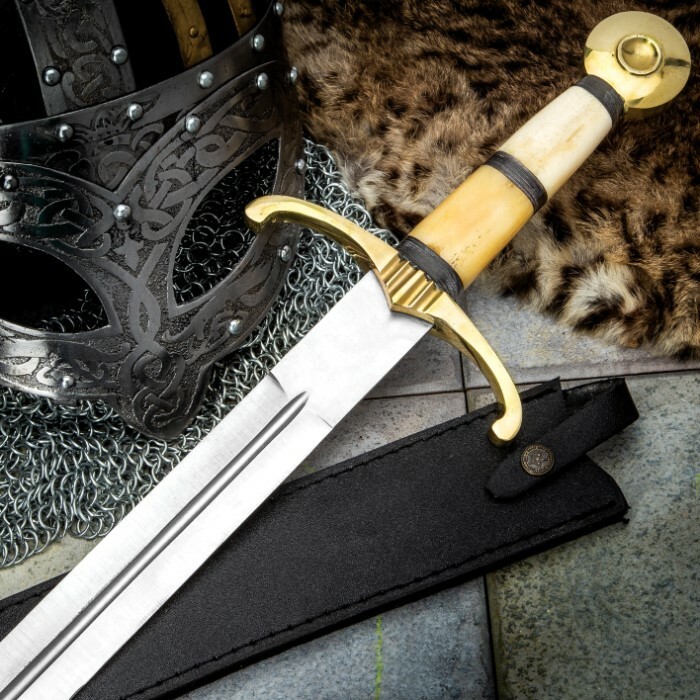 Storm the castle with the Camelot Bone Handle Sword and watch your foes shudder with fear. This is a great display item or cosplay item. 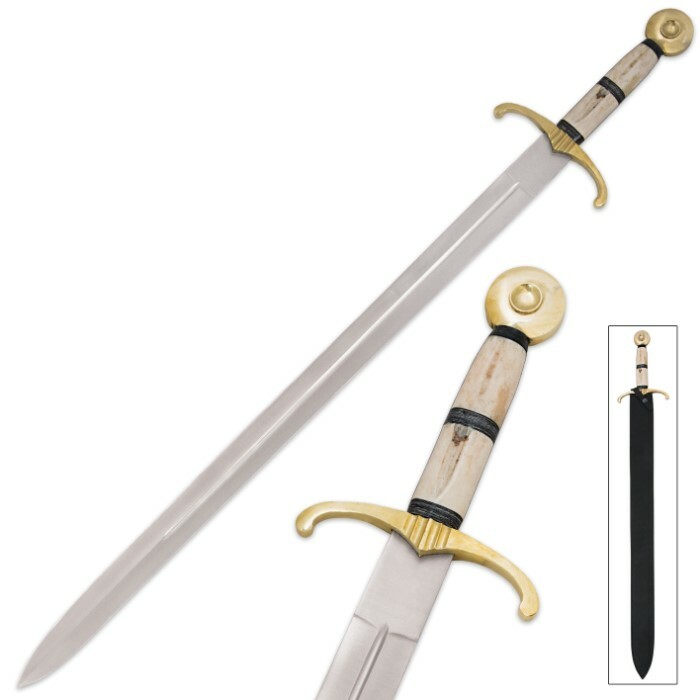 It has a 32” rust-resistant stainless steel blade and a genuine bone handle with a brass-colored guard and pommel of metal alloy. It is 40 1/2" in overall length and a black leather sheath completes the package. BUDK just keeps making great swords. 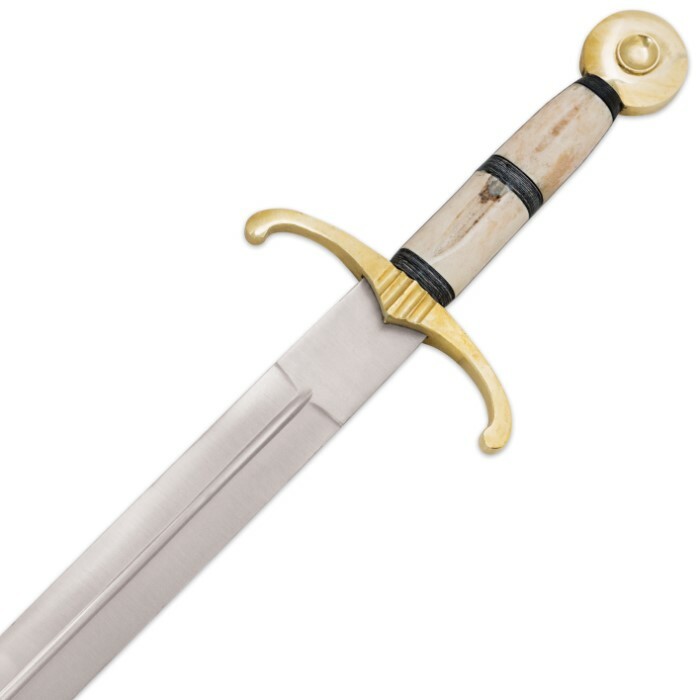 This Camelot Bone Handle Sword is another example of fine sword making whether or not it's a wall hanger or not. The blade of this sword is the perfect length and width for a Knights Long sword, a little heavy but not too heavy, but well made. The guard is the right fit for this sword, the guard and pommel is of heavy construction, the bone handle is beautifully done. The sword has good balance because of the weight of the guard and pommel. I really love this sword it is very much worth the money. I recommend this elegant beauty too everyone. Thank you BUDK. Alright fans of the movie "Ironclad" hear it is. The sword almost right out of the movie. And cheap too, this sword is awesome. Only for looks of course, not sharp at all. The quality is quite high though. A must have for medieval collectors like me. May 24th, 2016.The sword came in sooner than expected, which is a plus in my opinion. I opened the box to look at the sword, but something I noticed right off the bat was the tip of the sword. The tip was slightly curved, but not much to freak out about. Other than that the sword is beautiful and is a great way to start a collection. well I got this sword for the looks and its fantastic for the price but the blade i got has a very noticeable bend in the blade the edge is flat not dull but flat. but the handle is beautiful sheith is so so, but hey looks great on my belt. Overall, this sword is an excellent display piece, so long as it remains a display piece, the sword came in great condition and lived up to my expectations, but feels as if it could break if swung at something too hard. But, I have not attempted to break something with it, so I would not know. This is a beautiful sword. Well balanced. Great for swinging around or hanging on the wall. Not battle ready. Have the blade professionally sharpened if you want to cut with this because it comes blunt. Not dull, blunt. You can however still stab with it. It's pointy enough for that. For 30 bucks, this sword could be whatever you want it to be. Thanks BudK! I had my eye on this baby for a while. When it went down to $30, I figured why not. You know if your spending less than a couple hundred on a sword it isn't gonna be a real sword, but actually for $30 this downright good. The blade (a cut factory sheet of metal) is of a decent thickness, although I suggest replacing it if you plan on doing anything beyond showing it off. The sheath is standard. But the handle is NICE. A great weight, and feel. The quality is far surpassing a typical $30 BUDK sword. Thanks BUDK for giving such a NEATO product at a knock down price. I ordered this as a shot in the dark. You can never really determine the overall quality of these swords until you pick it up with your own hand. This sword is hefty, somewhat point-ward in how it is balanced, and mine at least was well connected to the handle. It is definitely a handful, and may take some getting use to as while it is quite heavy, it is certainly made for one hand. I personally like these qualities, though some may see them as a detriment. The sword is blunt, which is another plus for me, because I tend to exercise with some of these swords and a sharp one would only be trouble. Aesthetically it is very pleasing. The bone/horn/antler handle looks even better in person, and while the hilt and pommel are not the fanciest, they are sturdy enough and as handsome as 30 dollars before shipping warrants. The sheath is the standard cheapo sheath but it does secure the sword well, connects easily to a belt, so it does the job admirably. Remember, you paid 30-40 bucks, so it won't be a super fancy sheath. Overall one of the best purchases I have made from BudK. It is hard to tell sometimes from the photo weather or not an item is quality and well made, or inferior and cheap, Sometimes it is a hit, and sometimes a miss. This item is definitely a hit. I have two and three hundred dollar swords, and twenty and thirty dollar swords. Something about the feel of a well made quality sword that is present when one first picks it up. This one has that special well made feel, look, quality that says it is right on. I couldn't be more pleased with this one. I would rate this a ten, if there were a ten rating. Makes up for some of the disappointing items; and the best part is it is only thirty dollars, and not a hundred pulse that it should sell for. If this is the only item you buy this year, it will be the best buy of the year.